If you are diagnosed to have high-level cholesterol, maybe your first reaction is panic. Don’t. You can reduce cholesterol levels into a healthy range by following the steps I will outline on this article. 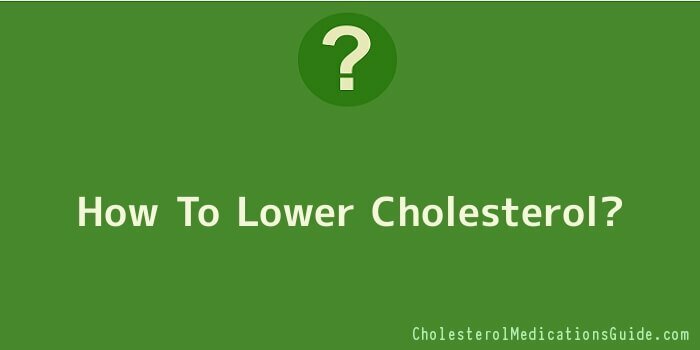 By properly using the steps below you will be able to get your cholesterol levels on the healthy ranges. The first and most important think you need to do on your journey to reduce your cholesterol level is by changing your diet into a healthier one. The most important thing on your low cholesterol diet is by avoiding or limiting foods that contain saturated fat as well as avoiding high cholesterol foods. While there are certain foods that can elevate your cholesterol levels, there are also some foods that will help you to lower your cholesterol levels. Your cholesterol level is not only affected by the food types you eat but it is also affected by the way you cook them. In other words, you will not only need to choose the right foods but you will also need to cook them right. It is advised for you to use a rack when you cook the foods, it will drain the fat. Instead of pan-frying, you will get healthier foods when you boil or grill them. Make sure to remove the skin from the meat, as well as all the visible fats. There are several tips you can follow to have better diet to lower cholesterol levels. Instead of using egg yolks, you can substitute it with egg whites or even eggs substitutes. You can find low fat or even fat free cheese to substitute the regular cheese. You can find many of them on the market. Use vegetable oil. You can use marinade, fruit juices, or wine to bake the food. It doesn’t mean you have to reduce your meal portion. What you need to control is your portion balance. To be able to lower high cholesterol level you will need to reduce the portion of high fat foods and put more on low fat foods. By adding more low cholesterol foods and reducing the high cholesterol foods intake gradually you will be able to reduce your cholesterol level. By taking more high fibre foods you will help your body to lower the LDL cholesterol from your blood. These foods will reduce the absorption of the bad cholesterol so it will be wiped out off your body. There are many high fibre foods you can add on your diet, including here are barley, oats, peas, beans, berries, apple, as well as fibre supplements. According to some studies, doing regular exercises around three times each week for about 30 minutes each, will help you to reduce bad cholesterol as well as increasing HDL cholesterol from your blood. Exercises will also help you to prevent getting heart complications that commonly found on high cholesterol people. Maybe, most of us will always have a reason or two to avoid doing regular exercises. OK, we are all living in a busy world with tight daily schedules. If you really can’t find the time to do your regular exercises, you can follow simple tips to ensure you still have some physical activities you need. There are also other physical activities you can do to help your body move. Washing your car, move the lawn, vacuuming the floor, and many other simple activities that will force your body to move. While proper cholesterol diet combined with regular exercises will help most high cholesterol people lower cholesterol levels without drugs, sometimes it is just not enough. And it actually is understandable since different people have different condition. For people who experience that dieting and exercising didn’t help them lowering cholesterol levels, maybe they should consider taking cholesterol medication. Ask your doctor for prescribe medications to help you lower your cholesterol level. There are some cholesterol drugs available on the market that will help you reduce your bad cholesterol levels or raising the HDL level, and most of them need the prescription from a doctor. Having high cholesterol levels on your blood may cause various health problems. High cholesterol will develop a kind of deposits inside the arteries that will affect the blood flow that can lead us to have heart attack or stroke. To be able to know your cholesterol levels, you will need to do blood test, as this is the most accurate way to know the levels. And it is suggested to do cholesterol test at least once a year to make sure your level is on the healthy range. Here are the cholesterol level charts you need to understand. Cholesterol is natural thing inside our body and it is produced by our liver since we do need it. However, some people are producing more cholesterol then the amount we actually need. And actually, there are various factors that can or may affect our cholesterol levels. There are factors that we have a control upon it while there are also factors we can do nothing about. When we are getting older our cholesterol levels will raise. Menopause women usually experience the raising of their LDL levels. We can’t control this factor though we can reduce the effect of it, of course. The same goes to heredity factor since cholesterol levels can pass across the family members. If one of your family members has high cholesterol levels your risk will be higher. Factors that affect our cholesterol levels that we have control upon. Weight: Many high cholesterol causes are related to overweight. Make sure you have a healthy weight range. Exercise: Doing proper exercises on regular basis will help our body to reduce LDL cholesterol as well as raise HDL cholesterol. Diet: The types of food and the amount of them can really affect your cholesterol levels. There are some high cholesterol foods as well as lower cholesterol foods. Type 2 diabetes: If you are having high glucose levels on your blood it will affect your cholesterol levels. Smoking: Smoking can reduce the HDL (good) cholesterol levels. Medications: There are some types of medications that can affect and increase your cholesterol levels. Discuss with your doctor on every medications you take. If you are diagnosed to have high cholesterol levels, there’s no need to panic. Start to learn how to lower cholesterol levels, follow proper low cholesterol diet plan, avoid high cholesterol foods, add more fibre on your diet, do regular exercises, and ask your doctor for suggestion.